I’ve been feeling especially nostalgic lately as I make the slow march to “30” and official end of my youth. Has it really been that long since I was reading The Babysitter’s Club, listening to Ace of Base (on a cassette tape), and watching Saved by the Bell? (The answer is yes– you’re OLD, Stephanie!) >.< Another way to know that you're creeping up in years? When fashion trends from when you were growing up start making a comeback, but this time they're labeled as retro. 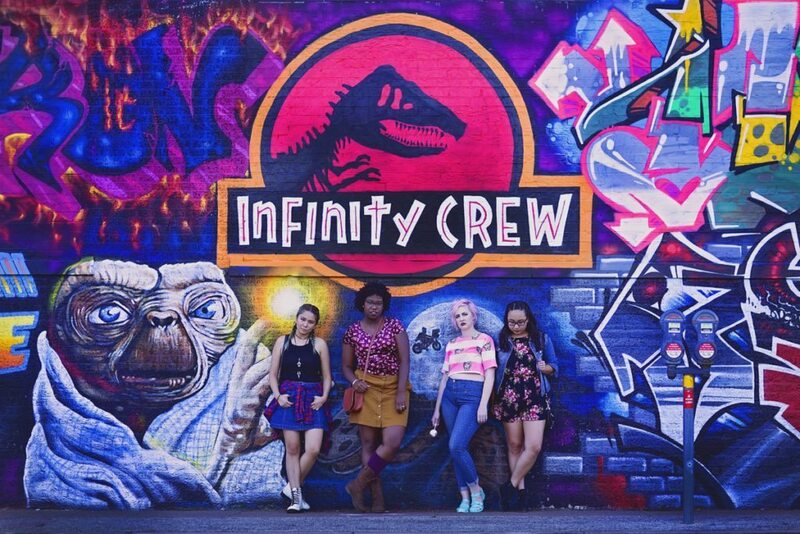 That being said, I had the best time shooting this 90’s themed Diversity Chic installment with Sevi, Valery, and our special guests Denise and Lindsay Steele Photography!! With Jordan off being the female version of George Clooney from Up in the Air, Denise kindly stepped in as our fourth fashionista. Lindsay drove all the way from Longview to take these amazing pictures and save me from having to jump between being in front of the camera and behind it. 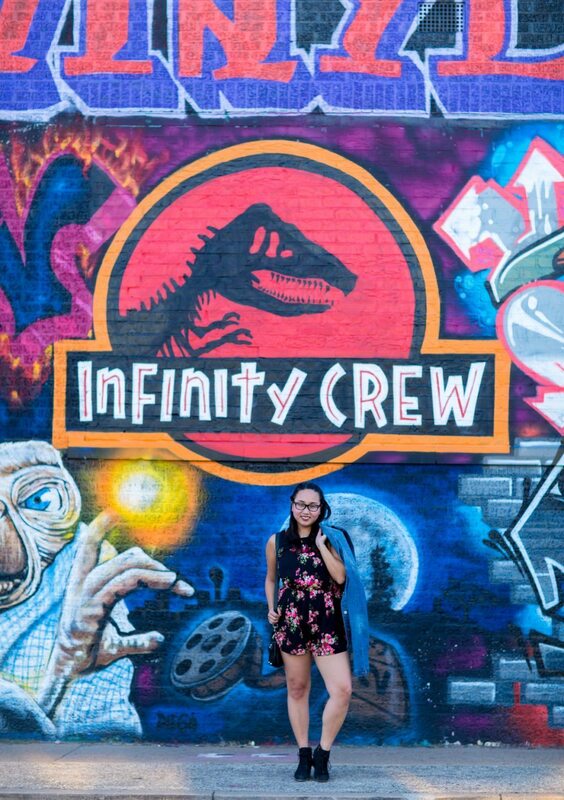 Everything seemed to align magically for this shoot, especially when Valery and Lindsay discovered this mural at The Quixotic World in Deep Ellum. The artwork was painted just for Vinyl Thoughts (the vinyl toy art show my talented hubby was featured in just a couple weeks ago), because their theme for this year was movies. Had we shot at any other time or during another month, the picture perfect backdrop would have been gone! 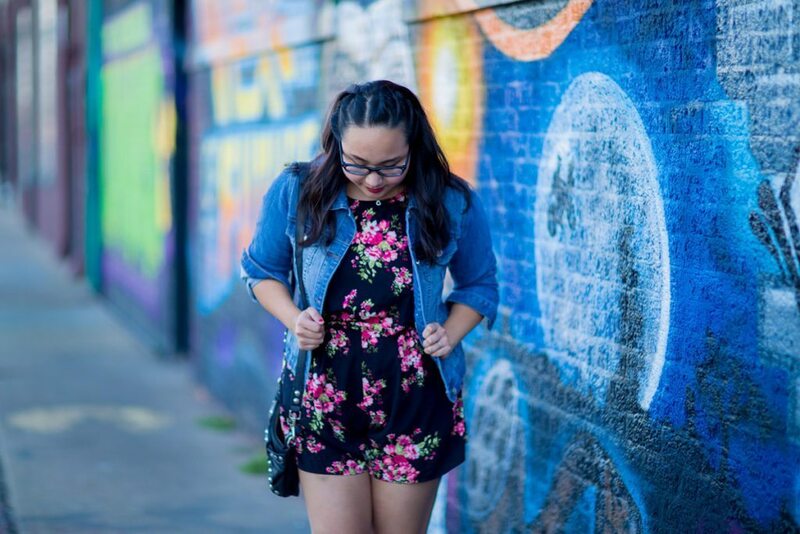 For my 90’s-inspired outfit, I combined two of my favorite trends– floral and denim. I’ve been wanting a denim jacket for awhile, and lucked out when I got to pick one out in the gifting suite of the Lulu’s Style Studio NYFW party. This floral romper seemed like a fun, modern iteration of the dresses I used to wear in elementary and middle school. I also pulled back my hair in the twists that used to be my go-to style. However, for a contemporary version, I did not include the butterfly clips! If there is one thing that sets 90’s fashion apart from other decades, it is the emphasis on individuality. There were so many different trends during this decade. 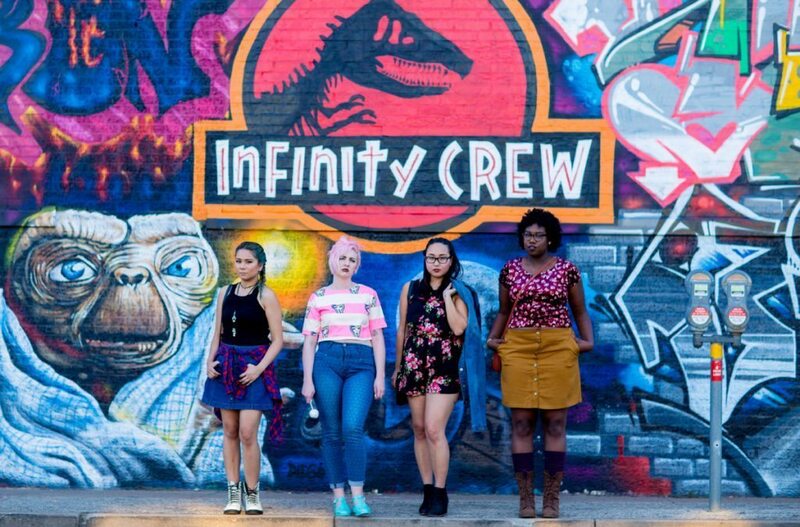 When looking at our group shots, and how unique all of our looks are, I think we nailed this. 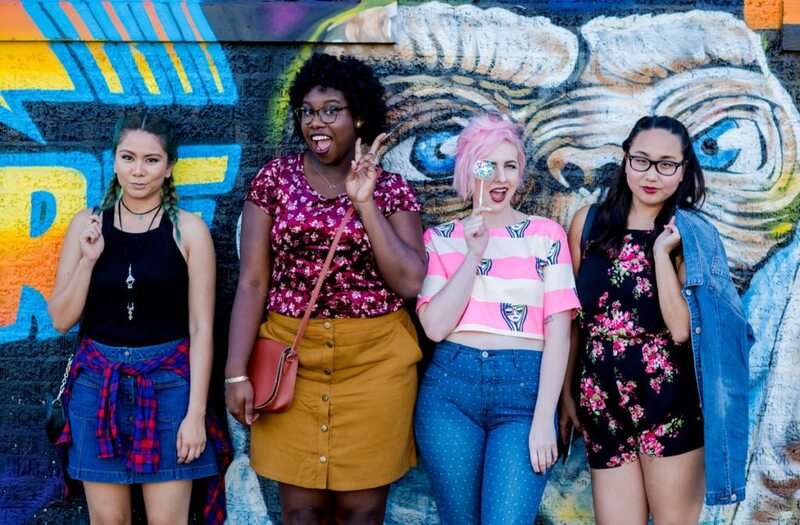 Don’t forget to visit Denise, Sevi, and Valery for details on their 90’s style! I’m not gonna lie to you– when I showed up at your doorstep, the first thing that threw me back to the 90’s was your hair!!! I was like “man, those were the good ol’ days” haha so cute! 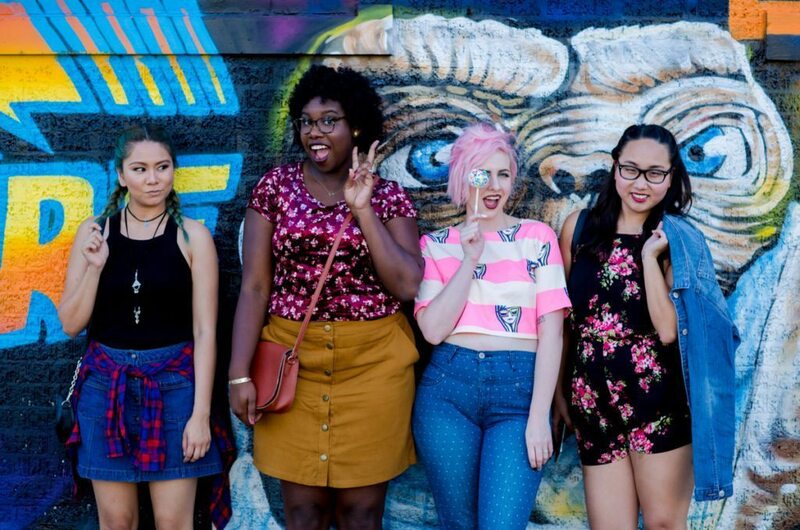 Your outfit definitely reminded me of Clarissa– she always wore florals! Love the pics and the girls. “Truly” missed Jordan. Hehe!! We did, too!! Glad you liked the pics, Nan! The legs! I love that you are showing off the legs!!!!! That floral romper and denim jacket combo was everything. I loved how effortless you pulled off the entire ensemble. Haha!! Thank you!! I almost thought about wearing tights underneath, but couldn’t find any >.< But it ended up working out!